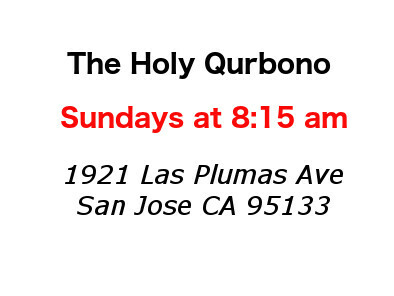 Welcome to St. Stephen’s Syriac Orthodox Congregation San Jose, California, USA. We have submitted ourselves in the hands of God Almighty to use us as He wills, for the glorification of His name. We approach these plans with openness, humility and hope. Come with us to share the joy of being used by God. We make disciples through sharing the good news of Jesus with our words and living out the implications of the good news of Jesus in our lives. To preach, in accordance with God’s will, the fullness of the gospel of the Kingdom to the peoples. Those who believe the gospel are united in the Spirit through Christ to the Father, and that unity is the basis of our fellowship. "For where two or three are gathered together in my name, there am I in the midst of them" - Mathew 18,20.